The Christmas market in the French city of Strasbourg is due to reopen on Friday morning, after the attack carried out by a gunman on Tuesday evening, BBC reports. Cherif Chekatt was killed on Thursday by police on a city street after he opened fire on officers. Three people died following the shooting at the market and several more are seriously injured. Interior Minister Christophe Castaner is due to attend the reopening. 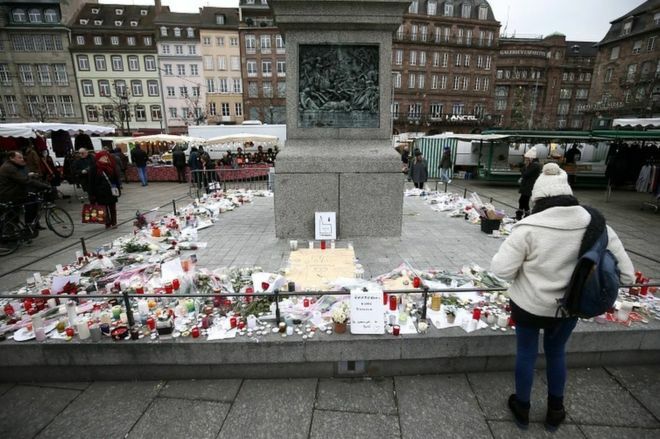 Strasbourg's mayor Roland Ries said security would be tight: "We have restricted the number of entrances with checkpoints, body searches and bag searches. We have reduced [the number of entry points] for greater control, with a better distribution of police forces," he told French radio. Strasbourg markets itself as the "capital of Christmas", and its festive market is a magnet for tourists, attracting two million visitors every year. The city had been in lockdown after the attack while more than 700 police and soldiers hunted down the suspected gunman. Chekatt, 29, had a string of criminal convictions in France and Germany and had become a radical Islamist in jail. Interior Minister Christophe Castaner said three police officers had spotted a man matching Chekatt's description on rue du Lazaret, in the Neudorf area of Strasbourg at 21:00 local time (20:00 GMT). As the police moved to stop him, the suspect turned round and opened fire. They fired back and "neutralised" the attacker, said Mr Castaner, who later went to the scene. Hundreds of French police and security forces had been searching for Chekatt. A large police operation had taken place in Neudorf earlier on Thursday, but ended apparently without results. Five people have been arrested in connection with the attack. They include Cherif Chekatt's parents and two of his brothers. Mr Ries said that finding Chekatt meant the worried people of his city would now be able to return to a normal life. At about 20:00 local time (19:00 GMT), a man opened fire close to the famed Christmas market near place Kléber. France's anti-terror prosecutor, Rémy Heitz, said the man had shouted "Allahu Akbar" ("God is greatest") as he opened fire. The suspect was armed with a gun and a knife and escaped the area after jumping into a taxi, Mr Heitz said. A search of his apartment in Neudorf revealed a grenade, a rifle, four knives - two of which were hunting knives - and ammunition.